Design and fabricate dental prosthesis or appliances such as space maintainers, crowns, veneers, bridges, and dentures, retainers, and labial and lingual arch wires. Use finishing burrs and grinding equipment to grind, smooth, and polish dental prostheses. 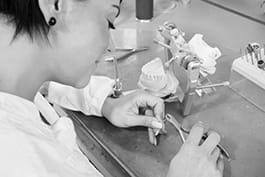 Examine models and impressions of the patients` teeth in order to determine the design of dental products to be constructed. Examine dental appliances to make sure that they comply with specifications, using articulators and micrometres to test for accuracy of occlusion. Maintain laboratory tools and equipment such as lathes, trimmers, grinders, articulators, and cleaning devices. Use the appropriate soldering and welding techniques to modify or repair components of removable and fixed denture prostheses.